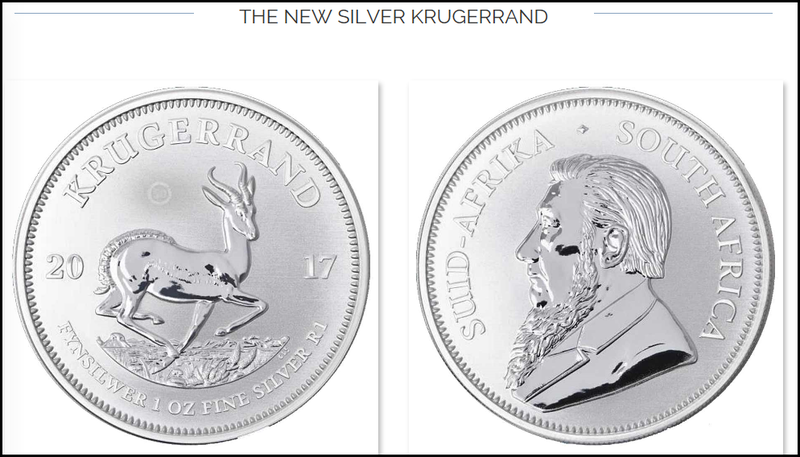 As interest in silver investment expands throughout the world, the South African Mint will produce its first 1 oz Silver Krugerrand, to be released this November. This is quite remarkable as the South African Mint has been producing Gold Krugerrands since 1967. Matter-a-fact, the South African Mint has produced over 50 million oz of Gold Krugerrands over the past 49 years. It is the largest Official Gold coin producer in the world. The U.S. Mint’s Gold Eagle comes in second with over 22 million oz produced since the program started in 1987. With the 50 year anniversary of the minting of the Gold Krugerrand in 2017, the South African Government will also release a new 1 oz Platinum Krugerrand along with its new silver coin. They also plan on adding some addition sizes of the Gold Krugerrand, such as a 1/20th, 1/50th oz variants as well as a 5 oz coin. The South African Mint plans on releasing 500,000 of the 1 oz 2017 Silver Krugerrand next year, along with 15,000 proofs. I imagine they plan to see how successful the initial coin sales of the Silver Krugerrand will be before they revise their annual mintage figures. Back in 1967, the South African government took the decision to release a new gold bullion coin to help promote South African gold as an investment vehicle into the international markets. Named after the famous South African President and nature conservationist Paul Kruger and the South African monetary currency, Krugerrands have been produced since the first coin was struck on the 3 July 1967. Next year represents the coins 50th anniversary and the South African Mint are pulling out all the stops to make it memorable. First thing to note with the silver coin is that it carries an actual denomination, 1 Rand, the gold never having done so. Apart from the inscriptions in the bottom half of the reverse face, the design remains unchanged from the original. For this 2017 coin, we’re going to assume that these will continue onwards unless they’re an unlikely poor seller, there is also a small privy stamp of the number 50 in a circle, the meaning obvious. I actually plan on purchasing some of these Silver Krugerrands. I think they are going to be a bit hit as investors will quickly acquire all 500,000 of the coins issued for the first year. IMPORTANT NOTE: I will be publishing an article on ExxonMobil within the next few days. I highly recommend checking out the article because it provides startling evidence just how dire the U.S. Oil Industry has become.